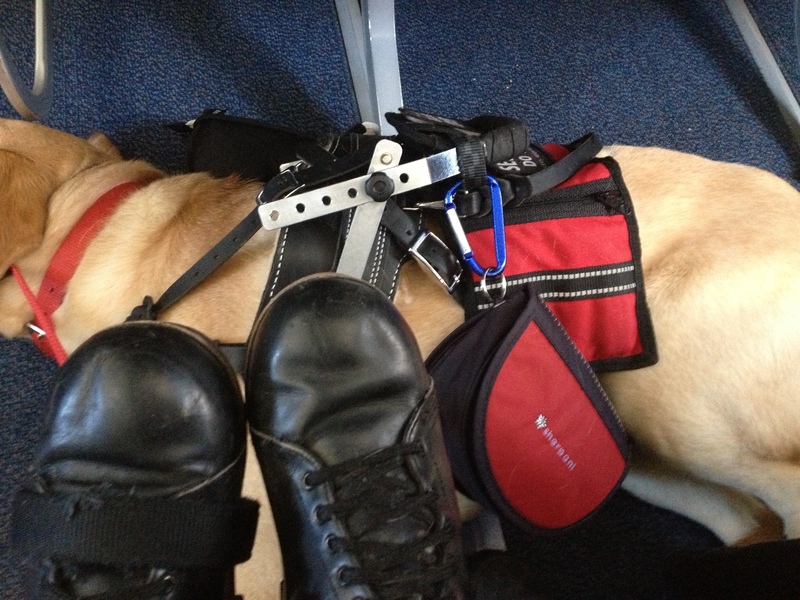 I’m ending my holiday hiatus with a post about life with a service dog. Well, several posts probably, because there is way more to life with a service dog than you think. Sure, it’s great to have your best bud with you everywhere you go, but it’s about more than that. Way more than that. It’s about partnership, responsibility, a deep bond, and an ever deeper gratitude. Today’s post is going to concentrate on the paradox of my life with Max; or, the way in which having a service dog mediates my disability, while also making it more visible. A dwarf more visible, you say? Yes, ’tis possible. I’ll get there, but let me digress, as I am wont to do. Just before the holidays, I did two things that got me settled on this being my next post: 1) traveled to New Orleans on vacation; 2) read Susannah Charleson’s book, The Possibility Dogs. Charleson’s book offers profiles of several psychiatric service dogs and their handlers, interspersed with her own story of training a “demo” dog, the ever clownish Jake Piper. It got me to reminiscing about my own experiences training Max, who is also an eternal clown. Like Jake Piper, Max is a rescue, whom I trained one-on-one with a certified canine trainer and behaviorist. It was one of the most intense endeavors I have undertaken, yet also one of the most rewarding. I don’t think I would have truly appreciated the effort that goes into training a service dog without doing it myself first. Another post will go into my training days with Max, but I think it’s worth mentioning here that service dogs are amazing animals whose training goes beyond skills and into behavior and compassion. Before I get where I’m going (yes, I’ll get there), I want to urge you all to respect these dogs and their work and to respect them and their handler when they are working. Do not talk to them, pet them, or even look them in the eyes. These are open invitations for a dog to break their concentration, which could be harmful to the handler if their safety depends on the dog. Part of the dog’s job is to focus on his partner; the partner’s job is to look out for the dog. Sometimes, that means being harsh with well-intentioned people who try to interact with your dog. Charleson, Susannah (2013-06-04). The Possibility Dogs: What I Learned from Second-Chance Rescues About Service, Hope, and Healing (p. 38). Houghton Mifflin Harcourt. Kindle Edition. It’s the notion of being in the spotlight that I want to talk about. In my post “Welcome to Lilliput,” I wrote about how having dwarfism necessarily puts me under the spotlight, but having a service dog has not changed that so much as it has shifted the focus. Obviously, my disability is not an invisible one; on the contrary, it is one of the most outwardly visible ones you can have, as my body is so far from the norm. However, it is very easy for people to assume that the disability stops there: with height. I’m short, so I can’t reach things, and I can’t walk as fast on those short legs. Full stop. Think again. For some dwarfs, this is the end of the affair, but for a great number of us, there is a lot of complicated anatomy inside that odd, squat body. (You can read more about dwarfism and disability in one of my Dwarfism Awareness posts). (You can learn more about The Possibility Dogs project on their website). I like to say that being a dwarf, or at least my particular experience of it, is to live in a liminal space, to inhabit the realm of both the visible and invisible disability. For, I am so visibly different, yet to many, so invisibly “disabled” by my body. I spent a good deal of time in college and grad school attempting to repress the disabled part of my persona. I walked with crutches for 10 years, but leaving for college offered me the opportunity to shed those walking aids in a place where few people knew me from my life before. Where my crutches helped me with speed and distance, I used a bike on campus to get from here to there. In grad school, I used the T or a car. This worked well for me until the long gap since my last major surgery started to close in on me in my late 20s, when my hips, which had long been severely arthritic, began to protest in earnest. This was the beginning of a new phase of my life, and what I now see as the moment when I needed to start “owning” my disability. I’ve had 5 artificial joint replacements in 9 years. I’ve learned that the gap from my last osteotomy to my first replacement was the exception, not the norm. Accepting the toll that my lax tissues take on my body has been a difficult journey, but to be honest, it started with the decision to get a service dog. My husband had been kindly nudging me to get one for a long while, but I was always “looking into it.” I don’t know what clicked, but I finally acquiesced in 2011, around my birthday. Ironically, Jeevan and I were at the local shelter looking at some potential candidates, and I was walking a ginormous, yet gentle, St. Bernard (can you imagine that?) when my shoulder just gave out in pain. No reason. I had reached for my bag, and it just gave up on me. I had been struggling with “bursitis” (self-diagnosis) for years but had begun weight training in hopes of strengthening the muscles. In the end, those strong muscles did put off the inevitable for a while. The X-Rays showed the truth: my shoulder joints were gone. Who knows how long they had been like that? When you have arthritis everywhere, it just creeps from one place to the next without you knowing, taking secret root in your psyche. Just another thing that hurts. You don’t notice the toll it takes on your health. The fatigue, the slowing-down, the grumpiness, the depression. Again with the digression! But, I spend time on the background info because it’s essential to my service dog story. I had to come to terms with these things, to take stock of them, before I was ready for life with a service dog. To get a dog was to admit that I couldn’t do it all on my own, or that I could, but at a dear price. After the “shoulder incident” at the shelter, I ramped up my search for a service dog candidate. I contacted a behaviorist to talk about what kinds of behavior a dog needed to show service potential. Any breed has potential, she said, but it’s true that Labradors and Goldens are very successful mobility dogs due to their retrieving instinct. Furthermore, with a breed rescue, you are much more likely to know the dog’s history than from a shelter. This is so important for a service dog because even thorough evaluation at the shelter doesn’t tell you everything that a life with a foster can. This is a dog who will go everywhere you go, who will encounter reactive dogs, people, and children. 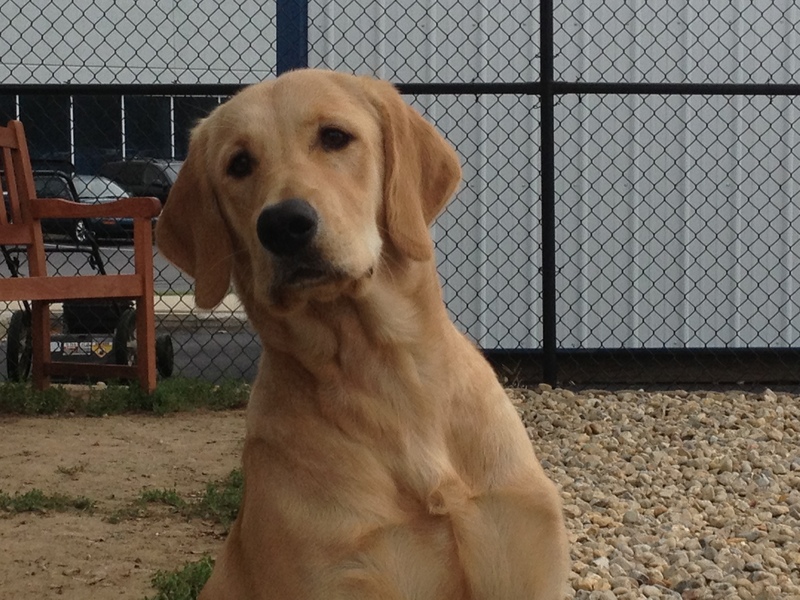 This dog will be an ambassador for other service dogs. Everything’s gotta click. I found my match through Lucky Lab Rescue. This is truly an amazing rescue, entirely run by volunteers. Not only did I end up with the best service dog a girl could have, but we have now fostered three dogs with them, and I have seen the work that goes on behind the scenes, and these people are amazing. They are dedicated, and so organized. And compassionate. They led me to Max. I filled out an application and was forthright in my intention to train the dog for mobility work, and I hoped this would not go against me in the end. It did not! An adoption coordinator called me and said that there was a list of dogs who would probably work, but I had to meet Max. And, meet him I did. He had me at woof. He was 1 year young and a clown even then. But, he was also confident, self-assured, but kind. He was unflappable. Four men banging around in a large truck with a lift? Whatever. I got this, lady. You want me to meet your other dogs? Even the crazy cattle dog rescue who hates everyone? I’m a charmer, lady. A charmer, he was, and is. He’s the best. The day I met Max. Look at that face! Again, I’ll get into the actual training later, but I want to talk about what Max does for my disability. As the handler in the excerpt said, having a service dog puts you in the spotlight. I’m used to the spotlight, but I’m used to the kind of spotlight you can pretend to turn off. Someone staring? Oh, I’ll just pretend I don’t see it. Some kid just pointed me out to their mom (who pretends it didn’t happen)? I can pretend it didn’t happen, sometimes. (You’re lucky if I do). I can just go on with my day if I desire. With a service dog, it’s different. As I said before, he’s an ambassador for all service dogs. When someone makes what they think is a hilarious comment about how “hard” his job is when he is sleeping in a restaurant, I think it is my duty to say, “how many dogs do you know who could sleep while people step over him with steak?” It’s his job to be good while we aren’t working. Sometimes, it’s his job to sleep, to lie down, to let people step on his tail, to let a chip fall by his face, to ignore the world that is not me. This is tough, and many people seem to think it is their job to tempt him or to get him to break his service and then make a comment when he does. What would you do if someone kept calling your name and telling you how pretty you are? You’d wag your tail, if you had one. I have to admit that I was too friendly about this behavior in the beginning, and so I let it slide, and now there are a lot of people around my small town who talk to Max. Mostly, it’s when we’re not actively working, but I’m sorry I let it happen anyway. It’s not fair to him to turn back now; he wouldn’t understand. I’m lucky that he resets very quickly. He’s got a greet command and a command to get back to work. I’m lucky he listens, really lucky. Believe me, with my next dog, I will not do this again. For the love of all that is right in the world, don’t pet the damned service dog. Don’t make kissy noises. Don’t talk to it. Don’t even ask. It’s hard to say no, especially if you’re a people pleaser. Make it easier for everyone: resist. It’s also true that having a service dog slows you down. It is a huge responsibility. Just “running in” a store is darned near impossible. You have to gear up the dog, get the dog in the car, seatbelt the dog in, drive to wherever, get the dog out, stop and educate people, get your stuff, get the dog in the car, seatbelt the dog in, get in the car, driver home. It’s a bit easier when, say, I want to run in my favorite coffee shop (go Roscoe’s! ); they know him there, and they know he’s a service dog. I can just put on his gentle leader and run in for coffee because I know I don’t need to use his bracing harness. Sometimes I brave places without his harness if I know I won’t need him to brace, but it makes me nervous. There is no requirement that a service dog wear a vest or harness, but it helps. Max does have a little badge that hangs off the leash, but I’m always risking some questioning when he’s not fully geared. Max fully geared, under my feet on a plane. I usually respond to random people asking this question with, “he’s a mobility dog, and I use him to brace., but he knows well over 50 skills.” I don’t try to elaborate on what’s wrong with me. Sometimes people push, but mostly they respect that. I just wish they wouldn’t ask. It’s personal. Traveling ain’t a picnic either. I have to pack for me, and for Max. He needs food, treats, a ball, some chews, extra poop bags. I have to remember peanut butter for the airplane to help pop his ears. Security is a nightmare. New cities mean new people, and new service dog cultures. Colorado is a dog place. It seems everyone has a dog, and in the mountains, people let their dogs hike off-leash. I hate this. I hated it before, but I really hate it now. Yes, your dog is friendly, but please, he cannot greet my dog. He’s working. See that slippery rock in my path? He’s going to help me over it, but if your dog distracts him, he’s not concentrating and not bracing. Put your dog on the leash! New Orleans is also a dog city, and there are a lot of homeless people with dogs off-leash. Makes me nervous. I hope your dog is friendly, but if not, does it have vaccinations? Also, one bad encounter with a dog could ruin Max for service. He cannot become afraid of dogs. Paris is also a dog city, and my Lord, there are a lot of yippy dogs out there. They tried to get Max every friggin’ day. 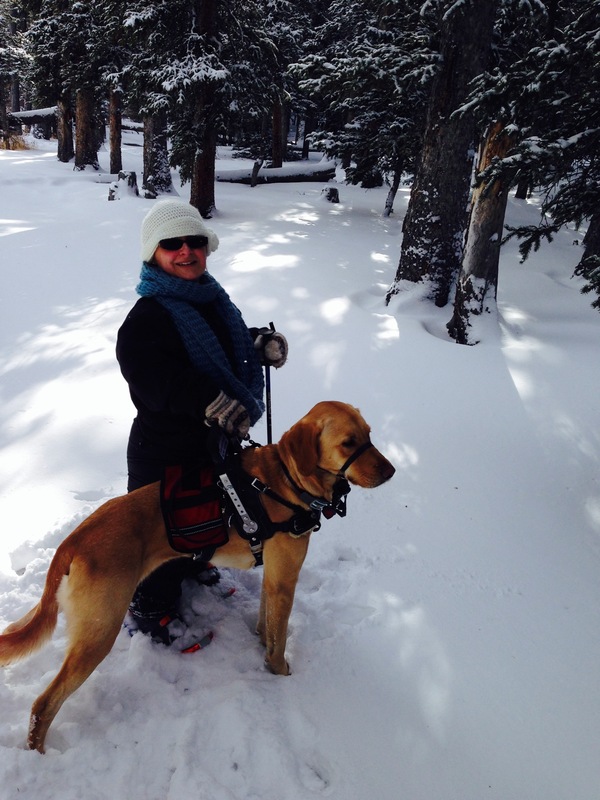 Max helping me snowshoe! This is one of the ways he helped return me to a fuller life, even if people don’t leash their dogs. All this being said, I have to also say that having Max is worth every annoyance. He has made my life easier on so many levels. Traveling is a pain, but less of a pain than it was before. Paris used to be so tough on me with its uneven sidewalks and steep curbs. I prefer busses over the Metro because there are no stairs to navigate into subterranean stations, but there is that one big step, and the crowds. I always hated getting places. People never thought of me as disabled, so they wouldn’t offer seats or help. This last time in Paris, though, people offered to let me on first, and offered to help me up that step, even as Max was there to brace, and they offered me a seat. He braced all over the cobblestones and awkward curbs. He braced me all the way down the Pantheon steps, which don’t have railings. This was, in fact, the first time I have been to the Pantheon. I have always avoided it because of the steps. Thanks to Max, I got to see my beloved Hugo, Césaire, and Zola in their resting place. 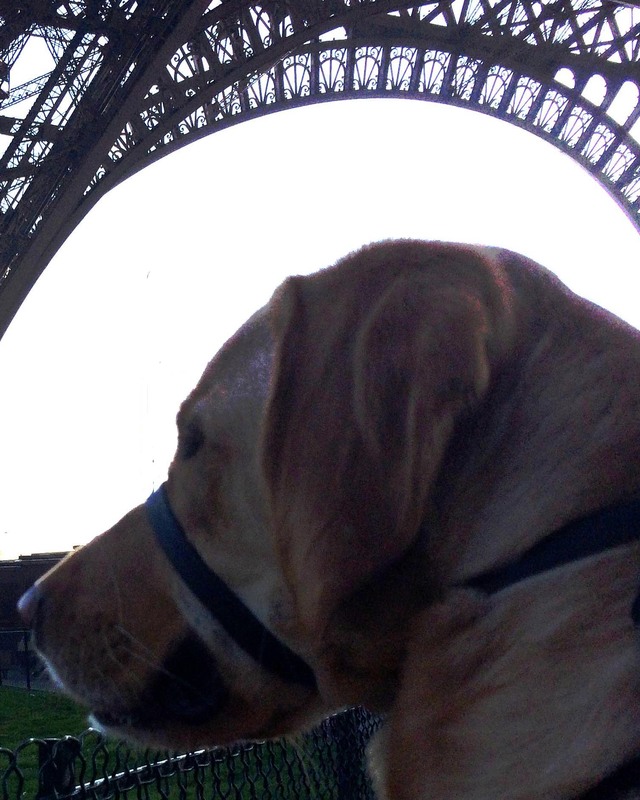 Max enjoying the Eiffel Tower. Max takes me out of that liminal space and puts me firmly in the disabled camp. He mediates my disability by making my world wider, safer, and more mobile. He also helps to mediate the fatigue, the slowing-down, the grumpiness, the depression. He mediates stares. People are usually way more excited to see a service dog than a dwarf, and that is fine with me, in the end. I’d much rather have to educate people about Max than be the object of curiosity. Children love to see Max (often mistaken for a horse, due to his saddle-like harness). I’ve always had to educate people about disability, it’s just shifted somewhere else. It is tough to always be in the spotlight, but I guess I prefer the gaze to be cast on my Max. He’s a ham and loves to wag his tail coyly as I explain why he can’t be petted to a little kid. It takes time, but it’s a worthy moment. I’d really like to live in a world where I didn’t have to explain any of these things, but that’s a bigger job. That’s why I write this blog. Yay for Amy and Max! That’s a very moving tribute to Max you concluded on! So Yay also for Jeevan who nudged you towards Max, and for the Lucky Lab rescue! I witnessed this incredible intense training while I was helping Amy after her first shoulder replacement surgery. The long drive was intense enough. The training with Max, Amy, and the amazing Jim was so focused, I could have been a fly on the wall. Jim encouraged the strong relationship between Amy and Max and worked on Max’s concentration skills. And I had to act like I never met Max when we were at the mall. It was really hard – for all of us. But Amy being Amy was determined, Max is an incredible animal, and Jim is the best trainer ever. i learned so much from your post. Thanks for educating us all on this important but often overlooked topic. As a mom of curious dog-Philic children I shall endeavor to keep them “leashed” around service animals. Please keep your posts coming. I enjoy your perspective.